This review is on the BearPaw Wilderness Designs Pyranet 1 Net Tent w/ Custom 12" Extended Silnylon "privacy" or "splash protection" walls. NET TENT IS SEEN UNDER MY MLD SOLOMID ON THE FAR RIGHT. This inner net tent performed well. I wanted to escape the bugs, but have more room than in a bivy, so I added a custom option for the bottom bathtub silnylon to come higher on the walls for extra privacy (so I could change in my tent without flashing people) and for added rain protection. 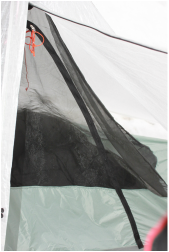 I was able to hang this net tent inside the shelters when I stayed in them, and then hang it inside my MLD SoloMid Cuben Tarp when I wanted to camp out. For the price ( about $110) and weight (about 12.5 oz.) it was cheaper but heavier than the MLD Solo Innernet. Overall the shelter worked fine for me, but I noticed a lack of attention to detail in the craftsmanship that bothered me. However, remember that THIS NET TENT DID MAKE IT 1,700 MILES WITHOUT A PROBLEM. SUMMARY: Were I to buy this style net-tent again, I would likely buy the MLD SoloMid Innernet and have that shelter modified with higher side walls to suit my preference. While the MLD tent would be more $$ it would be lighter weight and better quality build (sewing, fabric cutting). I found that the zipper constantly snagged on this tent, and while it never failed, it also made me question the quality and longevity.